CINCINNATI, OH (November 22, 2016) – Three polar bears from three different Zoos traveled a combined 1600 miles to their new homes yesterday. Cincinnati Zoo & Botanical Garden’s beloved Berit, escorted by a keeper who has cared for her throughout her 16 years in Cincinnati, arrived at the Henry Vilas Zoo in Madison, WI, after a seven-hour drive and quickly settled into the spot vacated hours earlier when Sakari left for the Buffalo Zoo. Buffalo Zoo’s Anana was midway to Cincinnati by the time Sakari arrived to occupy her space. The complicated, multi-Zoo shuffle was recommended by the polar bear Species Survival Plan (SSP), the Association of Zoos and Aquariums’ (AZA) advisory group that manages the population in North American Zoos when it became clear that 17-year-old Berit and her mate, 26-year-old Little One, were not going to produce offspring. After settling into her new home, Berit will be introduced to a four-year-old female named Suka. Sakari, Suka’s brother, will be a companion and possibly a future mate to Anana’s cub, Luna, who was born at the Buffalo Zoo in 2012 and is roughly the same age. Anana will join Little One in Cincinnati and, if all goes well, could breed this spring and produce cubs as early as next fall. CREW monitors the reproduction of polar bears living in Zoos throughout North America and will continue to monitor Berit. “Studying bears in Zoos provides unique opportunities for research that would not be feasible with wild bears. Because it is challenging to collect serial samples from the same bear in a field setting, scientists use bears like Berit, Little One and Anana as models to learn more about the complex physiology of this species,” said Curry. 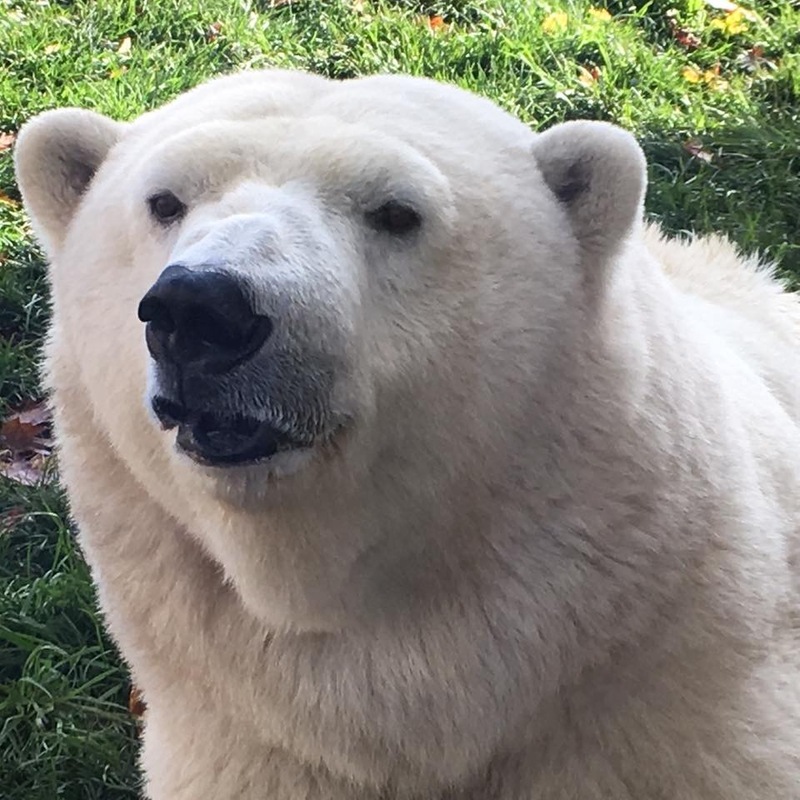 The Cincinnati Zoo is proud to partner with Polar Bears International as an Arctic Ambassador Center to help spearhead community efforts to reduce carbon dioxide and to educate visitors about global warming and wildlife conservation. Polar bears live in remote areas making them difficult and expensive to study. Monitoring and surveying them is challenging. Therefore, scientists don’t have solid figures on the total number of polar bears worldwide. The most recent IUCN report estimates that there are 26,000 polar bears left in the wild and lists it as a vulnerable species, citing loss of Arctic sea ice due to climate change as its most serious threat. After vet checks and some time to get comfortable in her new home, visitors will be able to see Anana and Little One in the Kroger Lords of the Arctic exhibit. To support polar bears locally, take the Polar Bear Challenge. The Cincinnati Zoo is working to raise a total of $35,000 by December 31st for CREW’s Polar Bear Signature Project. Donations to the Polar Bear Challenge will be matched by the Young Family Foundation & an anonymous donor. 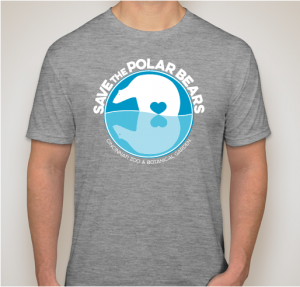 Donate online or purchase a polar bear shirt (limited-time) to contribute. By purchasing a polar bear shirt, you are helping to support the Cincinnati Zoo’s Center for Conservation and Research of Endangered Wildlife (CREW) as it works to create a more stable future for the world’s threatened polar bears.